This assumption can be very easily disproven: Millions of Christians today believe in the bodily resurrection of Jesus but even Christians must admit: not ONE of these millions of believers in the bodily resurrection of Jesus has ever seen a resurrected body! Therefore, one does not need to see a resurrected body to believe in the bodily resurrection of Jesus. “But some early Christians claimed that he appeared to them,” apologists will respond. The earliest story of resurrection appearances is found in the Early Creed recited by Paul in First Corinthians chapter 15. There is no mention whatsoever of anyone in this list claiming to see a walking, talking, broiled fish-eating resurrected body. In fact, the Early Creed gives zero description of what anyone on this list allegedly saw! Only in the last three Gospels do we find stories of anyone claiming to have seen a resurrected body. And as I have shown here, these stories have all the signs of being literary/theological embellishments (fiction). People today see cloud formations and stains on a wall and believe that they have seen Jesus’ mother. So why is it so improbable to Christians that similar illusions were responsible for the early Christian Resurrection of Jesus belief??? Superstitious people believe the darndest things! 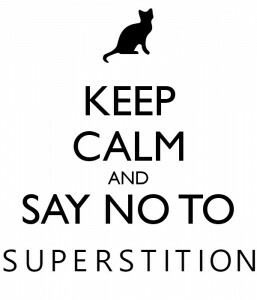 Just say NO to superstitions, folks! Next postDo You Need to See a Resurrected Body to Believe that a Resurrected Being has Appeared to You? Nobody alive today ever saw Julius Caesar, either, but as far as I can tell, millions of people, including scholars, believed he lived and actually did stuff. It doesn’t require “seeing” Julius Caesar to believe he played a role in the formation of the Roman Empire. What “millions of Christians believe” is the testimony of others regarding the resurrection of Jesus. They don’t need to see “Jesus, resurrected” in order to believe he was resurrected. They just need to believe that someone actually did, at some point, and that the “reports” are reliable. I hope this doesn’t seem all too strange to you. It really shouldn’t. You believe all kinds of things yourself, without actually having witnessed the thing you believe. What you believe are “trusted reports”. Must someone see a resurrected body to believe that that body has been resurrected? No. Millions of people who have not seen the resurrected body of Jesus believe that he was bodily resurrected. This is evidence that one does not need to see a resurrected body to believe that someone has been bodily resurrected. So now let’s go one step further: Must one see a body to believe that a resurrected being has appeared to him or her? No. We have clear evidence that the answer is no. There are Christians today who believe that they have seen Jesus’ mother Mary when all they have seen was a cloud formation, a shadow, or a stain on a wall. So if Christians today can see Jesus’ mother in a cloud formation, why couldn’t Christians living 20 centuries ago have “seen” Jesus in a cloud formation, and at some point in time later, come to believe that the Jesus who appeared to them (as a cloud) was in reality the bodily resurrected Jesus? Other than the stories in the Gospels, there is no evidence that anyone ever claimed to have seen a resurrected body. It is perfectly plausible that every person listed in the Early Creed saw a cloud formation, a shadow, a stain on a wall, or a bright light…and believed that it was the bodily resurrected Jesus appearing to them. Without the detailed Gospel appearance stories (which I have demonstrated are very probable embellishments/fiction), Christians are left with one eyewitness claiming only that “he had seen the Christ”. And this eyewitness admits he was prone to “visions” which in today’s medical terms means someone who has vivid dreams or hallucinations. Those types of experiences are NOT good evidence upon which to believe a never-heard-of-before-or-since resurrection claim. I’m just curious: How often do you see stains on a wall, and think it’s a person? Do you often see spots of light and believe they are, say, elephants? No. That is not correct. 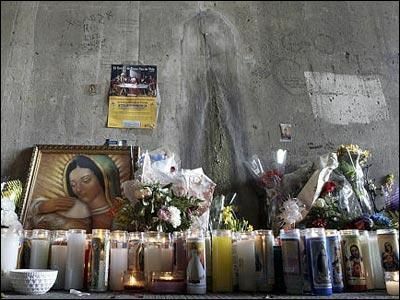 What they believe is that they have seen evidence of “the Virgins” presence. BUT – they believe that is possible because someone they trust (namely, the Pope) told them that Mary was “assumed” into heaven. Whether the Pope is right or not is another matter. It is of absolute importance, though, that the Pope claimed that “the Virgin” was assumed into heaven, and that the Pope was understood as “trustworthy”. But, this is a case of people believing that one thing (a strange cloud formation) means another thing (Mary has visited). But these little “experiences” are NOT the basis of the belief at all. They had to believe – BEFOREHAND – that Mary had been assumed into heaven, and, they believe that because the Pope told them so — and it was THIS “statement of fact” (the Pope’s statement that Mary had been assumed into heaven) that even makes it possible to then believe that little puffs of water vapor might be “the presence of the Virgin”. You keep leaving out that important “First Step”. You keep mis-stating the case altogether. Here’s a non-spooky example: People, via the news, receive a warning that a convict has escaped from prison, and is believed to be somewhere in the “BigSub” subdivision of the town. People believe that news. Consequently, they shut their doors and lock them. And, when somebody hears a strange noise, the call the cops, saying (essentially) “I believe he might be in my back yard”. Or if they see a strange shadow move across their window shade, they call the cops and say “I believe he’s right outside my window”. They suspect most anything can be “evidence” of the convicts presence. And why? Because they’ve been told, by a trusted source, that a convict is loose in their neighborhood. What they believe is the report of the trusted source. The other stuff? The sounds? The shadows? That’s just what they see as evidence of what was reported by the trusted source. Of course, most of that “evidence” will prove to be bogus. The sound in the back yard was nothing more than a neighbors cat, the shadow on the window shade was nothing more than the shadow of a trees branch blowing in the wind. The fundamental question has to do with what was initially reported. Is there a convict on the loose? Is that even true? Was Mary assumed into heaven? Is that even true? Was Jesus resurrected? Is that even true? But, you seem to think you’re really on to something important in talking about the secondary “effects” of a “primary statement of fact”, as if it’s something that only “religious nuts” do. It’s not. It’s something YOU do, also. Of course not. I don’t know if anybody would be able to know that they actually saw a resurrected body anyways!